Social media is crowded with selfies, pictures of food, targeted ads, and — for many Kyrgyz users — black and white photos of their country’s past. Photos posted by the account @bishkek_kg on Instagram regularly get hundreds of likes and comments. The account’s photos of architectural fixtures when the city wasn’t so densely built up and everyday life during the Soviet era are incredibly popular. Ernis Temirkan, a journalist and Bishkek native, opened @bishkek_kg after running the successful page “Bishkek – Moya Stolitsa” (Russian for “Bishkek – My Capital”) on Facebook for six years. Once the project really took off, Temirkan enlisted the help of two friends — Baktybek Meimanbekov and Konstantin Konkin — to help manage the pages. Initially, Temirkan started out collecting cards and photos he found stuck in books or in storage boxes; once he became established as a journalist he began a more structured search through newspaper archives for photos of Soviet-era Kyrgyzstan. Over time, “Bishkek – Moya Stolitsa” slowly became an increasingly interactive and collaborative heritage preserving project. 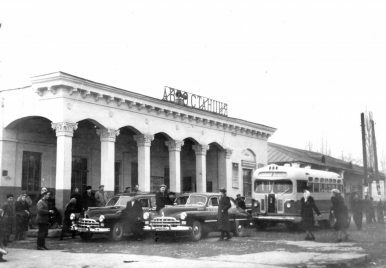 Most of the photographs are black and white images of Frunze, the name of Kyrgyzstan’s capital from 1926 until 1991, when the Supreme Council of Kyrgyzstan approved a measure to rename the capital. A post on February 5 commemorating the anniversary of this decision drew some heated reactions from social media users. Sergey Solomatov wrote, “Why did they have to go and do that? We lived better when it was Frunze, things were better then.” Tynchtyk Kazybek uulu replied, “Bishkek is Bishkek and it will stay Bishkek,” a pun on a well-known Soviet slogan about Lenin. @bishkek_kg is not the only social media account cataloging Kyrgyzstani or Central Asian history, but it is the most widely followed. More than 14,000 and 20,000 people subscribe to Temirkan’s Facebook and Instagram accounts, respectively. “If I’m honest, I don’t really know why the account is so popular,” Temirkan told The Diplomat. According to @bishkek_kg’s Instagram analytics, more than half of both accounts’ followers are between 25 and 34 years old — old enough to have been born at the tail-end of Soviet rule, but young enough to have experienced their entire childhood in independent Kyrgyzstan. The age skew could be due to the platform, given young Central Asians’ observed preference for Instagram, but Temirkan says the Facebook page’s followers have a similar demographic balance. This suggests that young people in Kyrgyzstan are curious about their capital city’s history. Bishkek has developed a lot in the past five years, with revamped underground pedestrian walkways and a sudden proliferation of shopping malls, ritzy restaurants downtown, and Western-style coffee shops. With so much of the city’s landscape changing — which in many cases, means destroying Soviet-era buildings and monuments — there’s something comforting about seeing photos that trace a visual consistency over several decades. Temirkan jokes that when he retires, he wants to open a museum. The irony in his long-term goal is that he already does run a museum of sorts. Just as the nongovernmental organization Women of Kazakhstan figured out how to expand a private collection of photos into a well-curated digital museum with thoroughly researched exhibitions, “Bishkek – Moya Stolitsa” is slowly transforming from a pet project to a public good. Improved digital infrastructure and pushes for reform are changing how Central Asian politicians and bureaucrats govern.